In Greater "Fork" Lauderdale, dining aficionados and foodies of all kinds will re-discover the top restaurants that make dining here so Lauderlicious. The new luxury hotels and top names in culinary delights are bringing a windfall of elegant eating to Greater Fort Lauderdale. Those who want to enjoy a uniquely Fort Lauderdale approach to dining can take a boat or Water Taxi to their dock-side restaurant of choice. Featured restaurants include Shooters Waterfront, Valentino&apos;s Cucina Italiana, Burlock Coast at The Ritz-Carlton, and YOLO on Las Olas Boulevard - because "you only live once." Want a steak? Try Council Oak steakhouse at The Seminole Hard Rock Hotel & Casino in Hollywood. Visitors looking for other exciting, eclectic options won&apos;t stay hungry for long. Variety includes a "dock and dine" dinner at Blue Moon Fish Co. or a burger that&apos;s been voted America&apos;s Best at the funky Le Tub. For a host of restaurants in one location, visit the The Galleria at Fort Lauderdale for Blue Martini, The Capital Grille, P.F. Chang&apos;s, Seasons 52 and Truluck&apos;s, among others. Want to enjoy a uniquely Greater Fort Lauderdale approach to dining? Take a boat or Water Taxi to your dock-side restaurant of choice - then cruise the Intracoastal to see magnificent waterfront homes. 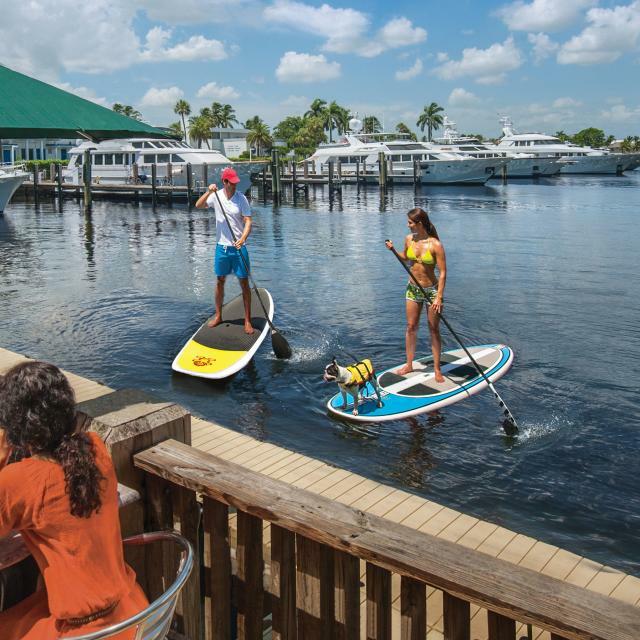 Click here for a list of dockside restaurants.